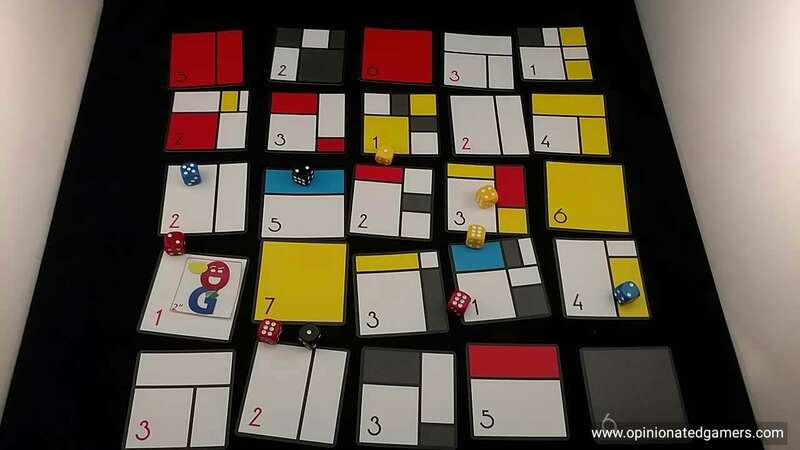 I have always liked the clean blocky simplicity of Piet Mondrian’s artwork, and I was naturally drawn to a game with his name in the title. 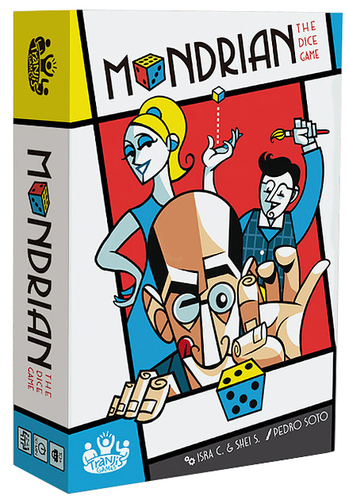 I had seen some pre-show pictures of the game, and at least from afar, the game looked like it had you creating the distinctive color block patterns with cards… Which was a little weird, because it was sold as a dice game! At the show, I was given a nice demo of the game at the stand – and I was pleasantly surprised to find that the game is actually a dexterity game! There is a grid of cards laid out on the table – in our 4 player game, this was a 6×6 grid. The cards are placed face up so that you can see the color grid and point value on them. Each player gets a palette – which is both an action selector as well as a small player aid. They also get the five dice in their color. Finally, there are three white cards (blank canvas cards) which are given to each player as well. 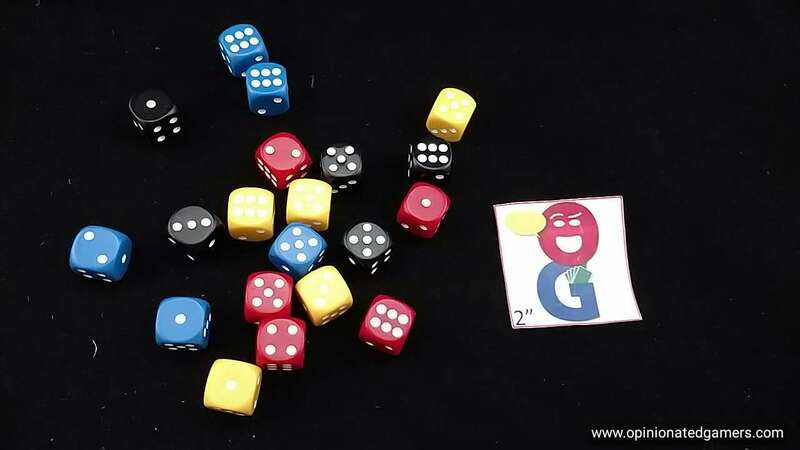 Going clockwise from the start player, you take one of the dice off your palette and then play the die using the action corresponding to where you placed it. If the die lands anywhere within the boundaries of the 6×6 grid, the roll counts and must remain there. It may be that the die does not land on a card – but if it is within the grid, it does not move. Also, if your die touches any other die during movement, regardless of where it ends movement, the roll is complete. If the die is completely outside the grid (and it did not hit another die), you get a single chance to use the same action to get the die to end within the grid. Play then rotates around the table and the next player plays one of his dice. This continues until all players have played all their dice. In the scoring round, players now try to collect cards from the grid. Going in clockwise order from the start player, players get the chance to claim one card per turn. You can take a card if the number of pips that you have on that card are equal or above the number printed on the card. Note that if there are multiple player’s dice on a card, the die with highest value takes preference. If there is a tie for value, the player who rolled first in the round breaks ties. If you have a die on a card but the die value is lower than the card value, you can discard a card from your hand to the table supplement the value of your roll by the number on the discarded card. The discarded card takes the place in the grid as the new card that you acquired. If a die touches multiple cards, it can be counted towards either card that it touches. In either case, if you take a card, you discard all dice that you used to claim that card. Other player’s dice which touch only that card can also be given back to their owners as they cannot be used to take cards this round anymore. When all players have claimed all the cards they can, all the rest of the dice are collected by their owners. An additional die is taken from the supply and all player again choose their actions that they will use to roll in the next round. After the end of four rounds, the game ends and moves into the scoring phase. Note that no new cards are dealt to the grid. Cards that had been acquired simply leave empty spaces within the grid. All players first count the number of cards that they have collected – which includes any of the blank cards which they were given to start the game. 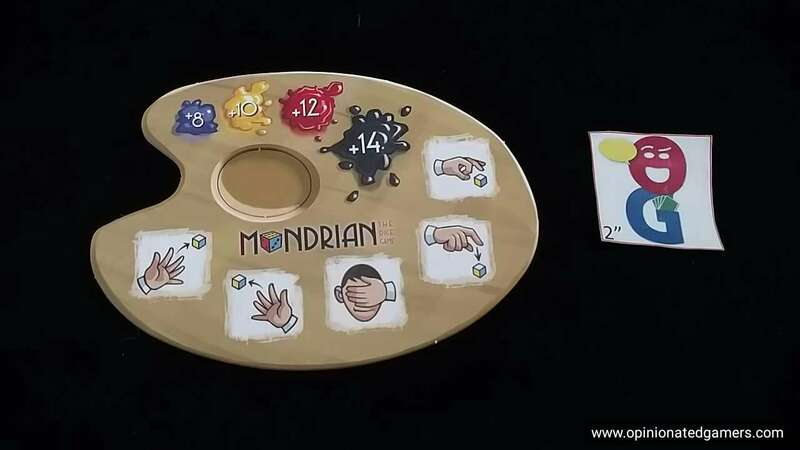 The final canvas size will be based on the player with the lowest number of cards – the size being set at the even number closest to the smallest hand size (rounding down). Players now look through their cards and build a rectangular grid of the specified size. 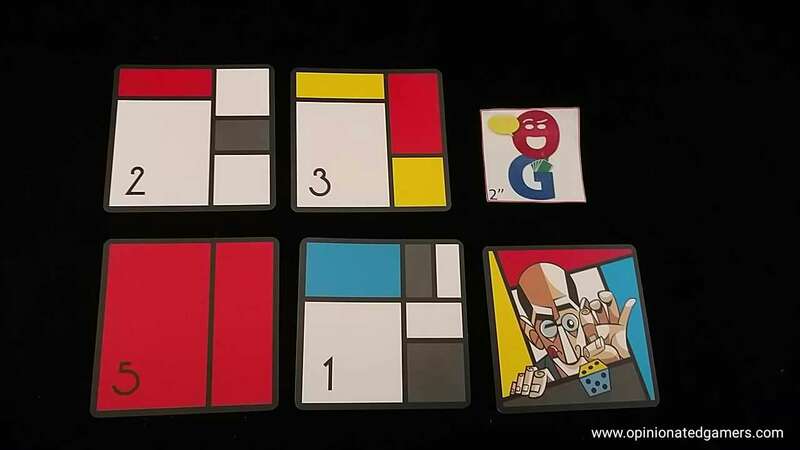 The cards can be played face down initially, and then when all players have finished their canvas, the cards can be flipped over to reveal the cards. There are two parts to the scoring. The first is based on the card value. Simply add up the card values printed on the cards played to the table. The second part is the color excellence scoring. The player who has the most blocks in blue/yellow/red/black in their canvas will score 8/10/12/14 points. If there is a tie for color excellence, the rules do not offer a tiebreaker – so we have played that all tied players get the full value. The player with the most points wins. If there is a tie for points, the player with the most white blocks in their canvas breaks the tie. The game has hit the table twice, and it’s a decent filler. Rounds are quick, and there are some interesting decisions to be made when choosing which actions to use. In the early rounds, the grid is a target rich environment. In later rounds, there will be plenty of holes in the 6×6 area, so you’ll have to be more precise (or lucky) to get your dice on the right cards then. Unlike a lot of dexterity games, I like the fact that this one gives players the chance to pick which methods they want to use to roll the dice. I’m sure that every gamer has their own strengths and weaknesses with dice delivery, and at least the game doesn’t force you into to doing unwanted things any more than you need to (or thankfully doesn’t leave it to fickle fate thru a random die roll or card flip). In order to keep things equitable, we definitely use the paintbrush template that is given to each player. All actions must be at least as far away as the paintbrush – i.e. you must roll/flick from one paintbrush distance away, you must drop your die from the height of at least one paintbrush. There appear to be two main strategies – either try to get the higher valued cards and build up your score through individual cards (there are a fair number of 6s and 7s) – though all of the highest scoring cards are all single color OR you can try to achieve color dominance with lesser valued cards which have many little blocks of color on them. The bonus for the color dominance in red and black (12/14 pts) can be a big thing. I do wish that the rules were a bit more clear as to what to do with ties in a particular color. The question has been posed on Boardgamegeek, and there has not been a posted resolution at the time that I have written this review. In the end, it’s probably just best to get as many cards as you can and give yourself as much chance as possible to work with the different cards in your hand to come up with the best balance. If you’re able to play a few high value cards and then also get one of the excellence bonuses, you’ll almost surely win the game. You can try to track/memorize which players have collected how many color blocks, but it’s still sometimes hard to predict how the players will choose to play the cards, so I’m not sure that counting necessarily does you much good. The game arc is a little weird. As I mentioned earlier, when you start the game, the grid is full and players are using their most preferred two options of delivering the dice (and you would thus assume their most accurate). A lot of cards tend to be taken in the first round, and a decent amount in the second. By the time you get to the third round, more than half of the cards could possibly be gone. Now people have even more dice to try to get onto fewer and fewer cards, and it often feels that luck plays an even larger role in winning a card than anything else – a slightly anti-climactic ending. This would make more sense as a Jackson Pollock game.